I was honored to review this new book for my sweet friend and fellow real food and wellness blogger, Renee Kohley, over at Raising Generation Nourished. You may recognize Renee from her previous posts on this site. Over the years, she has shared a wide variety of amazing, delicious recipes and helpful health and nutrition advice with my readers. She is an incredible woman and I am thrilled to be able to call her a friend. Make sure you go check out her site because it is FANTASTIC! It’s important to start your baby on a nutrient-dense journey by preparing his or her first foods from scratch with healthy whole-food ingredients. You can steer their taste palates away from processed ingredients by getting back to the basics. Your care in the first years will result in a child who knows where their food comes from and who won’t shy away from fresh vegetables or wholesome ingredients. Plus, the recipes come together in a pinch and will save you time and money along the way. Nourished Beginnings is Renne’s simple, no fuss approach to feeding babies a wide variety of vegetables, fruits, meats, fish, and fats – without spending all day in the kitchen. She will walk you through safe foods to start for baby’s developing digestive system while nourishing their growing brains and bodies. Simple tastes of nutrient-dense food as they explore the family flavors in the beginning will develop into full toddler meals that nourish rapidly growing bodies. However, this is more than just a baby food book. This focused cookbook will also grow with your child. You’ll find simple starter foods for baby, then move onto nourishing meal ideas for the whole family and babies six to nine months, and finally foods for transitioning into toddlerhood. Plus, she includes a few traditional staples to always keep in your kitchen. With recipes such as bone broth for baby transformed into fresh spring vegetable soup for the rest of the family, Renee provides simple tips to feed more hungry mouths faster, easier, cheaper, and more nutritiously. With everything from single-ingredient purees for newborns to fuller meals that incorporate grains, nuts, and legumes for toddlers, you have all your bases covered. With Nourished Beginnings Baby Food, you will help your child develop healthy eating habits for life. Renee’s biggest goal is to show you how to make a nourishing meal for the whole family to enjoy – from the babies to the teens. Now it’s time to make your own baby food and nourishing meals at home! 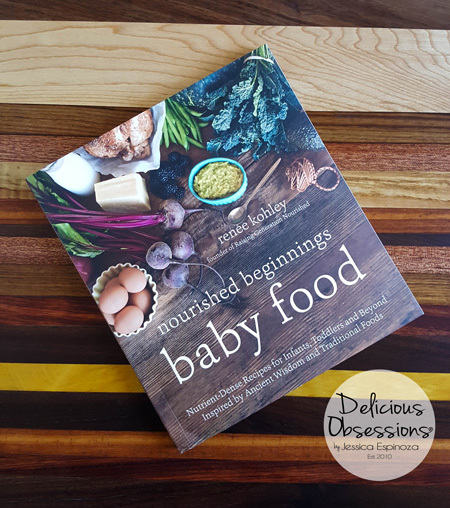 I hope you’ll pick up a copy of Nourished Beginnings Baby Food. Click here to learn more about Renee’s new book and how to order one for yourself or your loved ones. Now, it’s time for the best part of this review – a new recipe! You can stuff just about any sort of squash, but this is Renee’s very favorite way to do it. A fantastic gluten and grain-free way to enjoy a lasagna-type dinner as a whole family—including baby! What kid doesn’t love goopy, melty cheese?! Spread about ¼ cup butter over the flesh of the squash and season with sea salt, pepper, 2 cloves of minced garlic and 2 teaspoons Italian seasoning. Then divide 1/3 cup of the spaghetti sauce between the squash halves, filling the cavities. Roast the spaghetti squash, flesh side up, in the oven for 1 hour. About 20 minutes before the squash is finished roasting, you can make your filling. Melt 2 to 3 tablespoons of butter in a large skillet and add the ground sausage. If you are using unseasoned sausage, add 1 to 2 teaspoons Italian seasoning. Add the rest of the minced garlic. Cook over medium-high heat until the meat is cooked through. Add the diced onions and chopped kale and cook over medium heat, about 7 minutes, until the kale is bright green and cooked. 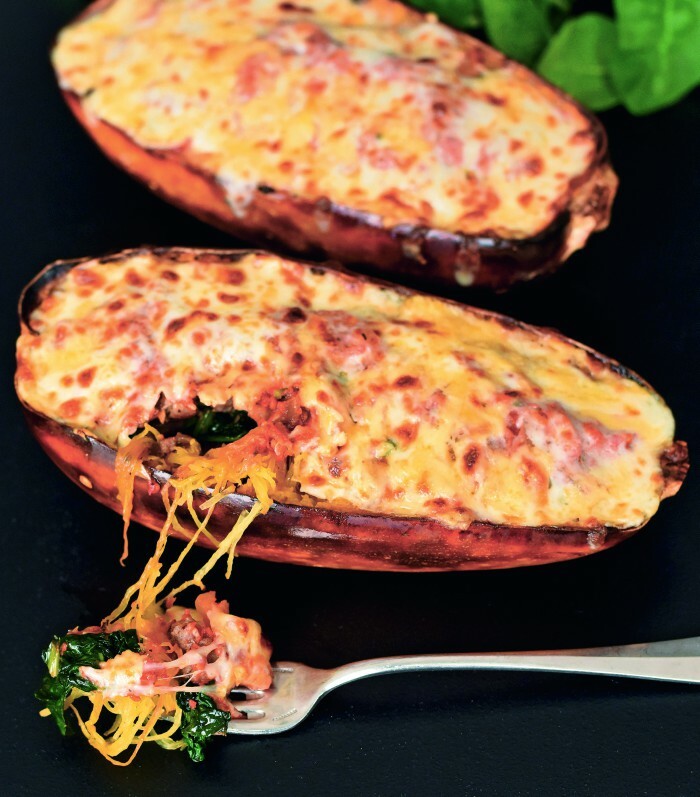 Put ½ to 1 cup of cheese over the roasted squash, and then divide the meat and kale mixture over the cheese. Divide the remaining 1/3 cup spaghetti sauce over the top of the filling on each squash half, top with an additional 1 cup of cheese, and cook 5 to 7 minutes or until the cheese is bubbly and melted. To serve, use a fork to pull out some of the spaghetti squash with the filling. Serve to baby on a spoon or finger-food style. You could pulse this in a blender if the baby isn’t handling pieces of soft veggies yet. Note: You can use grass-fed ground beef instead of the turkey sausage if you’d like. To season, use 2 teaspoons Italian seasoning, 1 teaspoon cumin, and 1/8 teaspoon cayenne pepper.